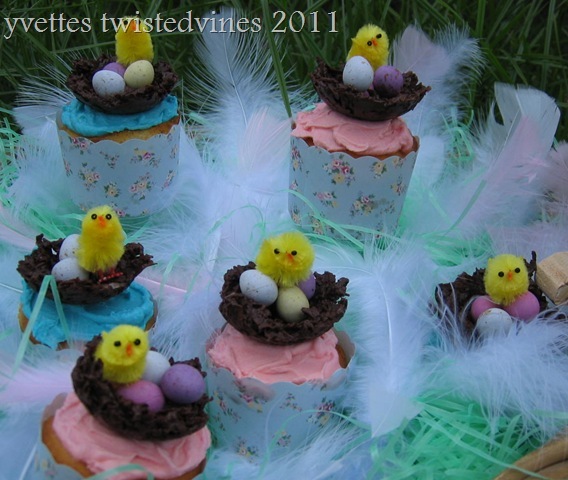 Easter nest cupcakes have been on my mind for a while now…after reading about them somewhere..(honestly can’t remember), and then finding a recipe on the back of the mini coloured Easter eggs. The recipe used the chocolate bar flake, but I decided to make a coconut rough mixture instead and actually make a nest form. I had a few ideas for these cupcakes and sort of rolled them all into one. 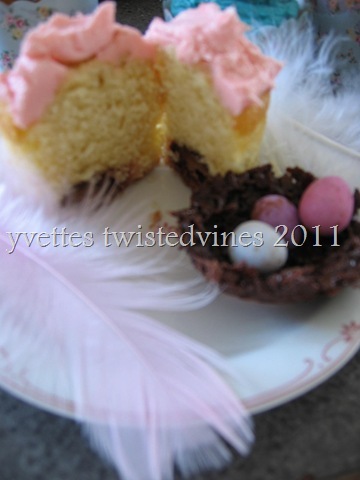 These cupcakes are real easy, not much work just a little more detail, and you know I love details. The cupcakes are a basic quick plain cupcake mix. Line 1 x 12 hole deep cup cake trays with cup cake cases. Combine all ingredients in a medium bowl and with electric mixer, beat on low speed until ingredients are combined. 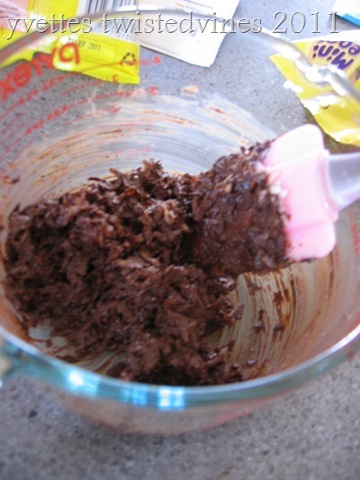 Then, beat on medium speed until mixture is smooth and changed in colour. 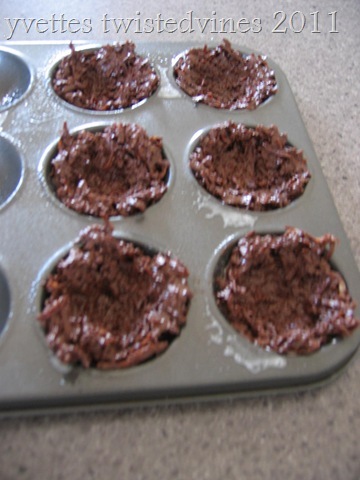 Half fill the cupcake cases with the mixture. 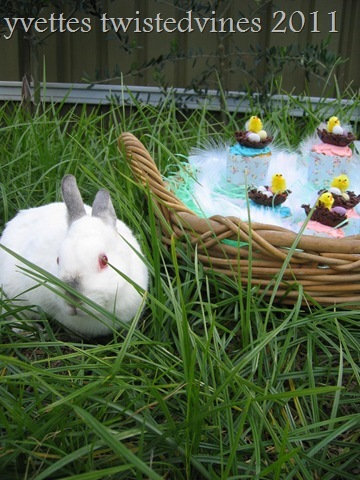 Now , here’s my secret to this cupcake: drop a soft centered Easter egg into the mixture. 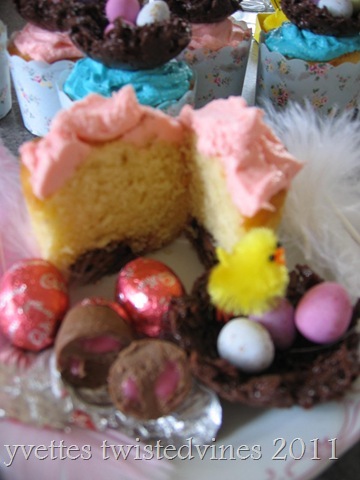 I used strawberry cream filled Easter eggs, but imagine what fun to can have will all the different varieties available. Plain cupcakes would go with all flavours, mint,caramel,chocolate. 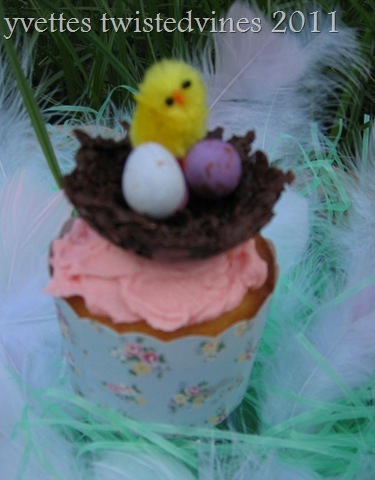 The Easter egg goes to the bottom of the cupcake so it’s a special secret sweet surprise! Just a touch of extra sweetness. Melt the chocolate in a bowl over a saucepan of boiling water. Add the coconut, until all the chocolate is soaked up. Then place into an oil sprayed patty pan tin…these pans are flatter than a cupcake tray. Spread the mixture and leave a hollow in the middle, like a nest. ‘Cottontail’ came to visit! 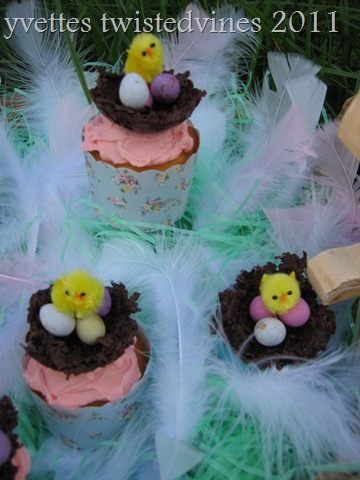 Fill the nest with mini chocolate eggs, add an ornamental chicken and you have a fun Easter cupcake. I’m telling you, you should design table-scapes or scenes for a living because this is absolutely breathtaking. 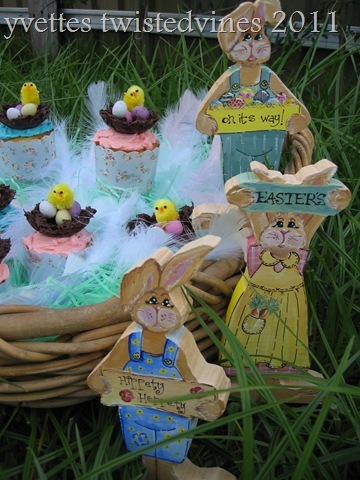 I love how you included all the spring color and the rabbit is wonderful. Very nice. 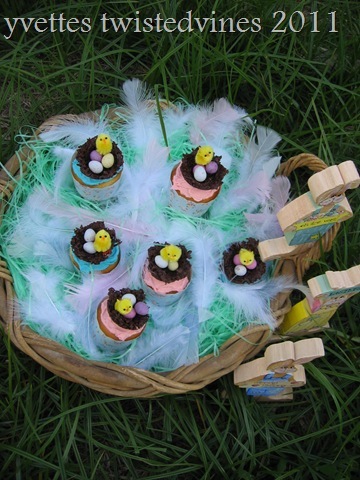 These cupcakes look delicious, and cute to boot! 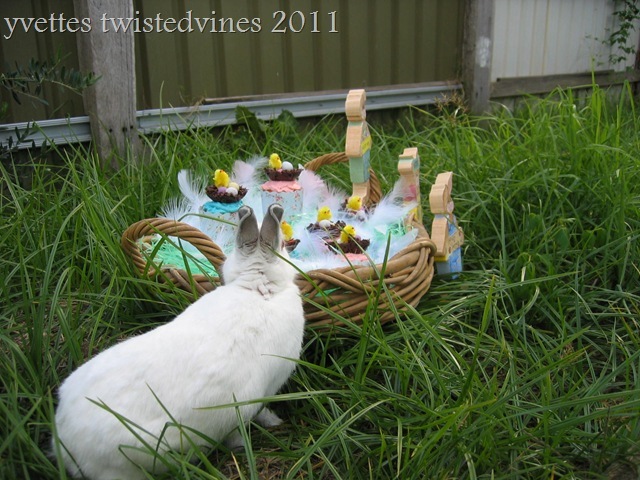 I am so excited about all of your fantastic Easter posts and the tutorials! Thank you! Everything looks so beautiful. Your blog is so charming and sweet – I love it! Thank you for sharing! Such a cute idea! 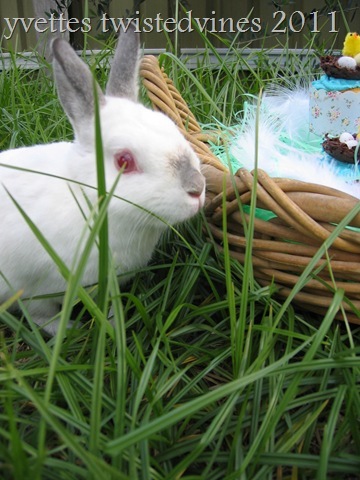 Your details are great and I love the little bunny in the picture too. Visiting from STF. Those are adorable. We love cupcakes and those would be so sweet at a childrens’ party. Wow! 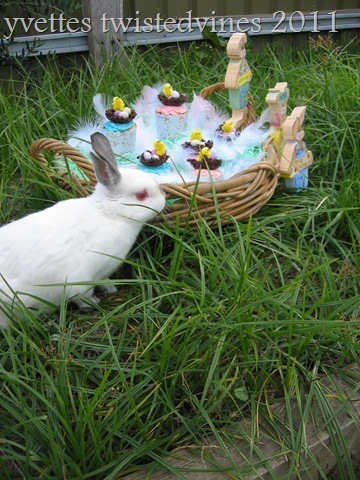 Your cupcakes are so cute! 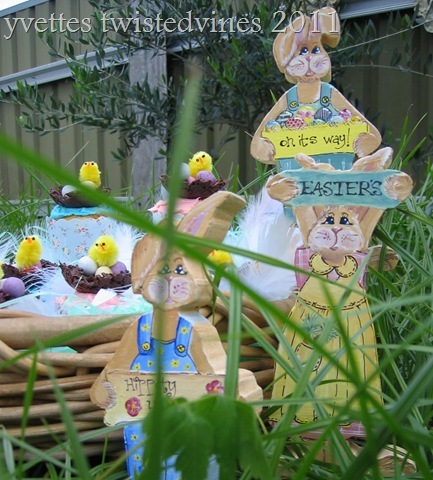 What a great idea for a Easter present! I just Stumbled your post. Thanks for linking up with Sweet Tooth Friday!